We are pleased to present to you, in exclusive, a NEW ATS RANGE OF SHAFT-MOUNTED GEARBOXES that completes the range of aluminium gearboxes by Transtecno. The ATS range is available in two sizes, ATS90 and ATS91 with two or three stages and maximum output torques from 400 to 600 Nm. Like the other ranges, it features a high degree of modularity: starting from a basic housing, it is possible to configure the gearbox with different input and output kits to suit requirements. Thanks to the structure in kit form, with just a few elements it is possible to produce all of the ratios and configurations shown in the catalogue. 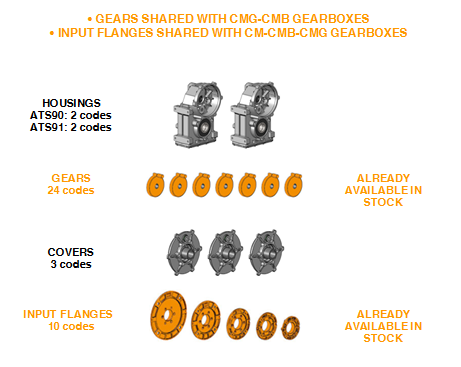 The modularity extends to the other ranges of gearboxes by Transtecno. ATS gearboxes are supplied complete with long life synthetic lubricant viscosity class ISO VG 320. One only housing version is suitable for base and flange installation, the mounting position is universal. The housing and PAM flanges are in die-cast aluminium, while the gears are always ground. They are also interchangeable with the main competitors. Please find attached a SPECIFIC CATALOGUE, complete with sizes and technical data. We are sure you appreciate the above and looking forward to receiving your orders and information enquiries.